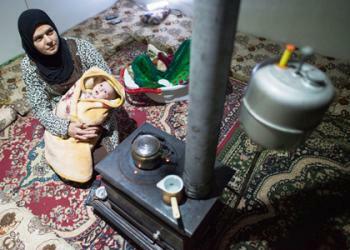 Nisrine, 23, a Syrian refugee, huddles with her heavily bundled newborn daughter next to the welcome warmth of a propane stove provided by International Orthodox Christian Charities (IOCC). Winter storms brought heavy snow and frigid temperatures to northern Lebanon’s Bekaa Valley where thousands of Syrian refugee families live in flimsy vinyl tents or tenement buildings that are little more than concrete shells with no electricity or water. Lebanon has no designated refugee camps in spite of the estimated 840,000 Syrians who fled there to escape the civil war raging in their homeland. The severe winter weather and lack of adequate shelter leaves vulnerable families with young children exposed to the elements and threatens their health and well-being. IOCC, an ACT Alliance member, is responding now to the urgent needs of 900 Syrian refugee families living in Lebanon’s coldest regions with the distribution of stoves and fuel for heating and cooking. IOCC is also providing new refugee mothers like Nisrine with pre and post natal care as well as health care for refugee infants and young children under five years of age.